Stepanova explored an entire mosaic of artistic trends from Symbolism to Socialist Realism, although she is now recognised above all for her interpretations of the Constructivist aesthetic. Stepanova was attached to the primary centres of the avant-garde movement after the Revolution, i.e., Inkhuk (Institute of Artistic Culture) and Svomas / Vkhutemas (Free Art Studios/State Free Art-Technical Studios) and was in touch with the leading artists, poets, and filmmakers of her time such as Gan, Kandinsky, Popova, Shub and, of course, her husband Rodchenko. Still, Stepanova was not a student of Rodchenko just as he was not a student of Stepanova, and, ultimately, her artistic physiognomy was different from his. 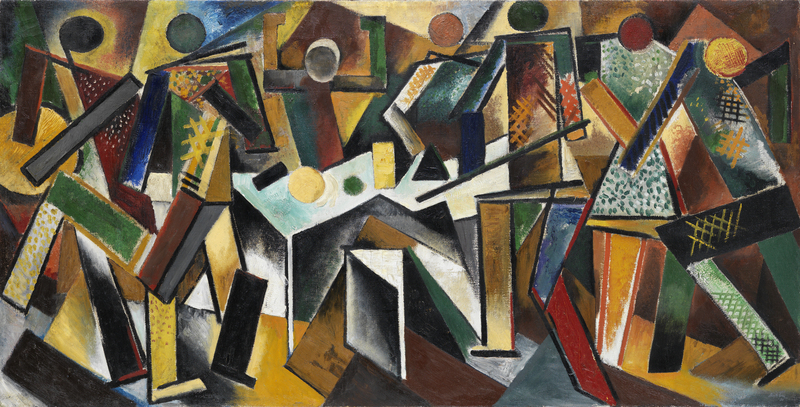 For example, she was not especially drawn to non-objective painting, did not regard photography as a replacement for painting, and did not investigate the three-dimensional and architectural constructions that fascinated Rodchenko, even though her involvement in the 5 x 5 = 25 exhibition in Moscow in 1921 and her support of utilitarian Constructivism at Inkhuk might indicate otherwise. On the other hand, both Stepanova and Rodchenko approached the artistic experience as one of public, not private, communication. The enharmonic chords of her visual poetry play to us, her syncopated figures invite us to arise and move, her posters and book illustrations refer to the telephone, the radio, the movies and other instruments of mass media. In this respect, Stepanova's orientation towards the human figure on the one hand and to utilitarian art on the other is logical and understandable, for, far from ignoring the human figure in her experimental work of the late 1910s and early 1920s, Stepanova remained with it. Perhaps one reason why she investigated the medium of the collage, using photographic fragments, pieces of newspaper, and advertisements with their direct references to concrete life, is that it helped to reintroduce a "readable" content into the work of art and, in this sense, opposed the abstract systems such as Suprematism of the same period. Stepanova's figures represent her concept of the new Socialist human being-robotic, efficient, dynamic-that also attracted Lissitzky, Malevich, Popova, and Rodchenko. These automatons such as Billiard Players represent action, for they all are engaged in some kind of sports, musical or motor activity, although, in spite of their mechanical quality, they also illustrate particular emotional states-excitement, obsession, serenity. As Stepanova's grandson explains: Stepanova investigated typical poses: sitting, standing, dancing, jumping, talking. The area around the figures was composed of the same elements, though larger in scale. Figures embodied a particular view of the world, based on geometry, structure and order." Billiard Players is an unusually large work in the Figures series, although the basic theme and formal configuration recurs in many graphic and painted works of the time. Although Billiard Players is a painting, to a certain extent Stepanova used the approached the assignment as a graphic exercise, defining the shapes with strong clarity, emphasizing the grey and white areas, and adding the dotted, criss-cross patterns as if the base material were graph paper. Not surprisingly, Stepanova repeated the musicians, dancers, and sportsmen in indian ink, pencil and linocuts where the contrasts are particularly abrasive.